Fast food with a gourmet touch! Any place that stuffs some meat and cheese between a couple slices of bread and calls it good might do the trick. 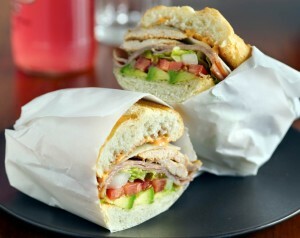 Want a Torta? You gotta go to Manny’s! More than 1,500 miles separate Minneapolis from the Mexican border. Yet when Manny and Vicky Gonzalez brought their beloved Mexican sandwiches to their new northland home, Manny’s Famous Tortas quickly heated up the local food scene. What began in 1999 as a small counter-top operation inside the Mercado Central on Lake Street has blossomed into two bustling locations in the heart of Minneapolis. Manny’s Tortas is considered a strong example of small business success and has played a large role in the revitalization of Lake Street in Minneapolis. Now, Manny's Tortas is participating in the Minnesota State Fair. © 2013 Manny's Tortas. All Rights Reserved.